I’m not the biggest fan of chain restaurants. They have their place in the dining spectrum but usually I will choose to check out an independent local restaurant before the chain. But I have a real soft spot for Boston Pizza. Growing up in Edmonton, there were quite a few Boston Pizzas. There was one not far from home and not far from high school. Boston Pizza was the kind of place teens could go on a Friday night if they weren’t at the movies, making out in their parents’ car or experimenting with alcohol. I was a good kid so quite frequently my friend group would end up at Boston Pizza where a server who was a friend or at least a friendly face would bring around you standard teen food. Back then, it was the 90s – a couple people (the rich kids) had their own fairly sizeable cell phones. We had a family cell phone that we shared. I had it more than most because I was the eldest and the one most likely out in the evenings. So back then, you had to figure out where you were going before heading out. So, meet at BP’s, or someone’s house, etc. I have no idea what kids these days do. I feel I had more in common with the youth of my parents than with kids nowadays. Technology, man. Wow, that turned into a tangent. Anyways, this is all to say, I still like Boston Pizza. It’s a good place to watch a game (even if the beer selection has NEVER been good) and a great place to take picky eaters. I don’t know what it is about BP’s but the pickiest of eaters seem to have their favourites there. I, too, have my favourites. Er… favourite. Of my top three from years ago, only one remains on the menu. The next to go was the Spinach Salad. They still have a spinach salad but they’ve changed it and the dressing. The old one was a simple spinach, bacon, onion, mushroom salad with a vinaigrette. I’ve tried the new one and like some of the additions but the old dressing was preferred. So, what’s my favourite? 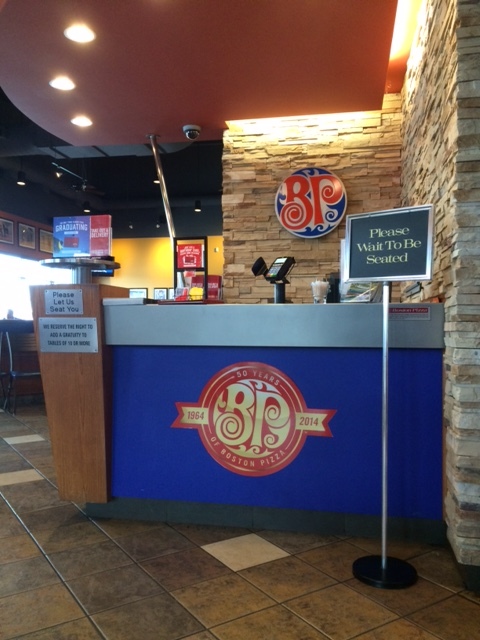 What’s the one menu item that if it ever disappears, I will boycott Boston Pizza for all time? 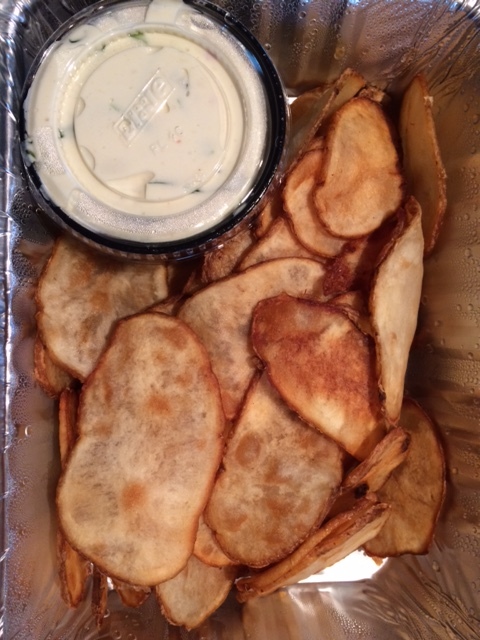 Thinly sliced potatoes, deep-fried, served with crazy tasty sauce. 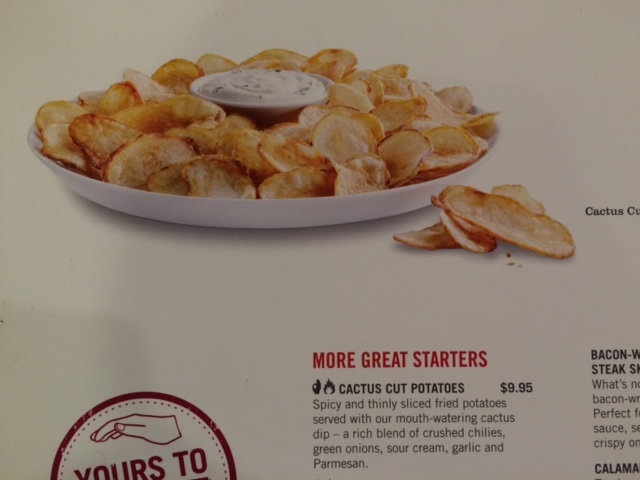 So, on a cold Whitehorse day, craving some comfort food, I went into Boston Pizza, ordered me some Cactus Cut Potatoes, and less than 10 minutes later, I was on my way. Should I have eaten them immediately, rather than let the steam build up in the to-go container, leaving them not as crunchy as I like? Yes. Likelihood of return visit: My last words above were literally, “next time”. Posted in Visit and tagged Chain Restaurant, Downtown, Memories, Pizza, Sports bar, Take out, Teenager, Visit, Whitehorse. Bookmark the permalink.